The Drumstick Dash 8K run/walk. Saturday, November 22nd, 2014 starting at 9am. Starts and finishes behind the Evansville Rescue Mission (500 E. Walnut St.). $20 through 11/19, then $25 through race day. Participants are encouraged to park in the Civic Center’s “back 40” parking lot. Packet pickup and late registration Friday from 10am-7pm in the large tent (cash, check, or credit). Race day registration from 7:30-8:45am. 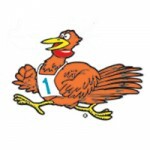 Proceeds from the Drumstick Dash will allow Tri-State families to bring home a full Thanksgiving food basket from your ERM’s Gobbler Gathering to celebrate with their loved ones.